The movie below is a 30 MB file. You will be rewarded. The film was taken by NASA photographers. Note on Movie: The YO-3A in this film is not flying in the quiet mode. You will notice a cut off exhaust pipe on the right side just before the leading edge of the wing. This helps with performance in ferrying the airplane. In Memory of Edwin W. Lewis Jr.
Ed Lewis was an honorary member of YO-3A Quiet Aircraft Association. www.quietaircraft.org Ed flew the NASA YO-3A that was converted to microphone flying platform to record rotor sound.<?xml:namespace prefix = o ns = "urn:schemas-microsoft-com:office:office" /> Ed was instrumental in getting our organization 10 minutes of footage of the NASA YO-3A Flying at Edwards AFB. In fact Ed was the star of this film! Click on the image to the right to see the footage. Our group will miss Ed, and we wish the best for his family. This is a Large File for it will take time to upload. Update 1-1-2010: Dale Hogg is NASA's new YO-3A crew chief. Dale flew in to 2010 Cable Air Show with Tim Williams, NASA's U-2 pilot and current YO pilo. Dale has taken an active interest in the history of the YO-3A. All of us YOs are looking forward to being of any assistance we can give Dale in helping him keep the NASA YO-3A flying. Update 11-13-05: Randy Hobbs (NASA) is the new crew chief for the NASA YO-3A. The NASA YO is getting a new engine, so it looks like she will be staying in service for some time. Randy sent me in the right direction in my hunt for new belts for the YO-3A 007. Thanks Randy! Update from Monte Hodges, Crew Chief on the Nasa YO-3A( formerly 69-18010) : Just wanted to let you guys know we flew the YO-3A today (10-26-04.) It was the first time she was in the air in over 7 years. Weather permitting we will fly again on Friday. If no problems on Friday then on Monday November 1 we will check out two more pilots and send the YO-3 to Moffett Field for about 1 1/2 - 2 years. It is so good to see it fly again. Hope all is going well with ship 7. Note: The first Crew Chief on NASA'S YO-3A (formerly 69-18010) was Gary Narjes 1970-71. The YO-3A has flown in Vietnam, served the FBI and now is used at Dryden for pilot proficiency flights. From stealthy spy plane to Dryden research support aircraft, the YO-3A has a colorful past and is serving as a pilot proficiency aircraft until it is called upon for a new support mission. Dryden acquired the YO-3A, which arrived here in December 1997 from the Ames Research Center. Ames acquired the aircraft in 1978, from an airframe and powerplant mechanics school for use as an acoustic flight research aircraft to record the noise levels of other aircraft inflight. This is accomplished with the YO-3A's wing tip and tail-mounted microphones. Past NASA missions of the aircraft have included sonic boom sound measurements of a NASA SR-71 and various helicopter and tilt rotor noise measurements.
" I've been working on the YO-3A since NASA acquired it," said Monte Hodges, the aircraft"s crew chief. "It was a major change to work on this airplane after working on modern jets." Lockheed developed the YO-3A from a Schweizer SGS-2-32 sailplane during the 1960s as an observation plane for use in the Vietnam War. The aircraft�s ultra-quiet design and large bubble canopy allowed pilots to move stealthly and at low altitudes over enemy territory to visually observe troop locations and movements, particularly at night. Somewhere between 13 and 15 of the aircraft were built. Dryden�s aircraft saw action in the war and is one of three still flying (the other two are privately owned). The FBI owned and operated two of the aircraft in the 1970s. Aircraft modifications greatly reduced the YO-3A�s noise. A specially constructed and modified muffler system for the engine reduces engine exhaust noise. For non-sound measurement flights, the muffler system is not operated as it reduces the engine�s available horsepower. The aircraft uses a belt-drive reduction system, which is quieter than a gear reduction system. The system turns the propeller 3 1/3 times more slowly than the engine turns. This system is similar to an automobile�s timing and fan-belt system in that rubber belts link various mechanical parts rather than metal gears. Additionally, the YO-3A has extra in sulation applied to its firewall. The engine valve covers have a sealant to reduce valve �ping.� The aircraft�s large custom-made wooden propeller also is much quieter than metal ones. It has a wider chord than the average propeller, allowing a lower rounds-per-minute rate which equates to quieter operation. It is also a handmade work-of-art made from Canadian Birch plywood layers one-sixteenth of an inch thick. The airplane isn�t the most responsive or the most comfortable airplane to take to the skies. The tandem seats are completely non-adjustable as are the rudder pedals, so pilot height differences cannot be accomodated. Instrumentation is very basic ­ no Instrument Flight Rules (IFR) equipment to be found here. Also, being a �taildragger� (only two main landing gear and a small tail wheel, as opposed to the more typical three main gear aircraft), taxi and takeoff can prove challenging for the most experienced pilot.The airplane doesn�t like to bank or turn very speedily, due to its basic sailplane-type cable-based flight control links. Range is limited to about 379 miles per fuel load, but this is greatly reduced on hot, thin-air days. "With the YO-3A I�ve learned about maintaining old aircraft. You have to think simple and direct, no computers," Hodges said. "A little patience doesn�t hurt either; the YO-3A is a very humble aircraft that requires alot of attention. It does offer a good view of life though ­low and slow." Figure 142. 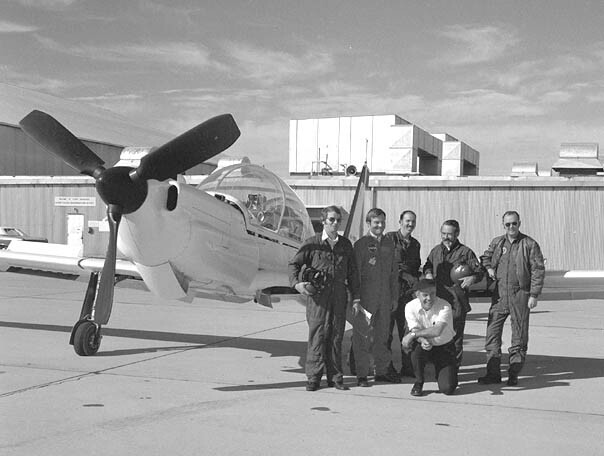 Lockheed YO-3A acoustics research team: From left to right: Don Boxwell, Fred Schmitz, Bob Williams, Lee Jones, Bob George, Vance Duffy. .....the impulsive noise during the landing approach of a series of Army helicopters (fig. 143); the results are reported in references 196 and 197. The aircraft was also used to evaluate the noise characteristics of the contending designs for the Army's Utility Tactical Transport Aircraft System and the Advanced Attack Helicopter, with results reported directly to the source selection board. The resulting external noise data proved invaluable and helped in selecting the eventual winners of both large Army contracts. This series of experiments also provided a unique database to the technical acoustic community that helped focus the research efforts of the next 20 years. These very successful in-flight acoustic test programs made it clear that this new research tool was an important asset to acoustic research. 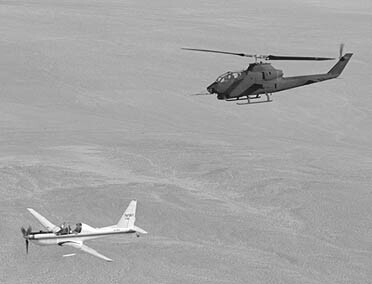 In mid-1977, Ames acquired its own YO-3A and took up the role of providing in-flight acoustic measurements for future rotorcraft research programs. Upgraded equipment and instrumentation were added to the NASA YO-3A aircraft, but the basic measurement procedures remained similar to those of the earlier test programs. Use of the YO-3A by NASA for far-field measurement of rotorcraft noise is described in references 198 and 199. Several major research programs were undertaken by  NASA, with the Army as a major partner. Tests were carried out on the AH-1, XV-15, UH-60, S-76, BO-105, and MD-900 aircraft. Typical results from the flight research effort, including comparisons with data from tests in the 40- by 80-foot wind tunnel are presented in references 200 and 201. Description: NASA's YO-3A parked on the Dryden ramp. The YO-3A aircraft was originally a Schweizer SGS-2-32 sailplane. During the late 1960s Lockheed modified over a dozen of these sailplanes to create ultra-quiet observation aircraft for use over South Vietnam. This particular YO-3A flew combat missions and was later sold to an airframe and powerplant mechanics school. NASA's Ames Research Center at Mountain View, California, acquired the aircraft from the school in 1978. It restored the YO-3A to flight status and fitted it with wing- and tail-mounted microphones as an acoustic research aircraft. Ames operated it at Edwards Air Force Base for noise measurements of helicopters and tilt rotor aircraft. One set of tests in December 1995 obtained free-flight noise data on the XV-15 tilt rotor. NASA also used the YO-3A for sonic boom measurements of a NASA SR-71 assigned to the Dryden Flight Research Center. NASA transferred the YO-3A to Dryden in December 1997, and as of April 2001 it was in flyable storage there. The designation YO-3A indicates that this aircraft was a pre-production (Y) observation (O) aircraft. Even though the YO-3A saw operational use, the Y designation was never removed. Its 210-horsepower Continental V-6 was modified to reduce noise. The engine was connected to a propeller through a belt-driven reduction system. This reduced the propeller's rotation speed. The propeller blades themselves were made of birch plywood and were wider than standard propellers. The result of these modifications was an aircraft so quiet that its noise was drowned out by the background sounds.